In December 2012 Holly wrote about Bristol synth pop act Gaptooth and her explicitly feminist single ‘Ladykillers’, a song that was so strongly worded that some radio stations wouldn’t play it. That the song was released mere weeks before Lucy O’Brien’s She Bop was re-published in a new, updated edition seems oddly appropriate. 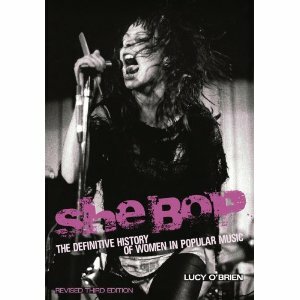 Hayley Foster da Silva has reviewed She Bop, and although wishing at times for a more personal touch, is impressed by the breadth of this history of women and the music industry, and is pleased to come away from the book with lots of new information. She Bop begins with blues in the early 1900s, and goes all the way through to the digital age and women such as Lady Gaga and Beyoncé. Video commentary: Memphis Minnie, ‘Ma Rainey’. This video is sound only, and is the celebrated blues guitarist’s tribute to singer Ma Rainey. You can read the lyrics here.